Three hard-working elected officials are bringing to bear some resources for residents of their district who want to demystify the property tax appeals process. State Representative Ron Sandack, House Minority Leader Jim Durkin and Senate Minority Leader Christine Radogno are hosting two seminars this week in Lisle and Darien. Do you wonder if you are paying too much in property taxes? 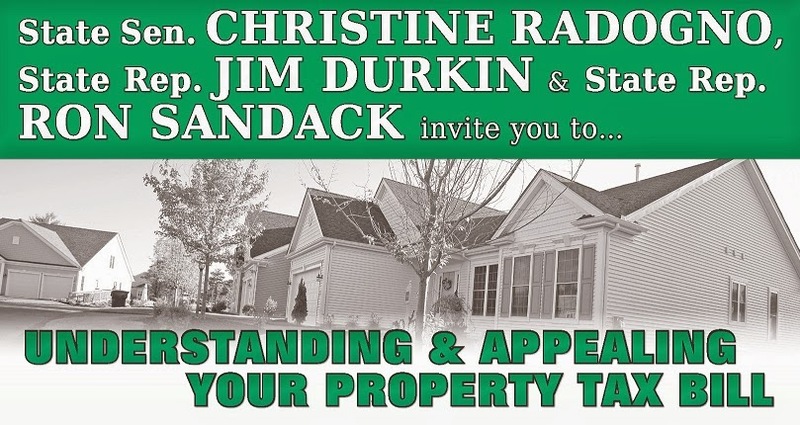 Area state lawmakers Christine Radogno, Jim Durkin and Ron Sandack will be hosting a couple of FREE seminars on July 31, 2014 to help Lisle and Darien residents to better understand their tax bill and how to appeal a property tax over assessment. The first seminar will be held at 10:00 a.m. at the Lisle Township Tax Assessors Office, 4721 Indiana in Lisle. There will be a presentation explaining how taxes are assessed and how property owners can seek an appeal. Lisle Assessor John Trowbridge will assist in the presentation. Darien residents are encouraged to attend the second seminar at 6:00 p.m. at the Darien Police Department, 1710 Plainfield Road in Darien. Theresa Cockrell, the Downers Grove Tax Assessor will assist with the Darien presentation. The Darien location is limited to 43 participants, so if you are interested in attending you will have to RSVP by calling Rep. Ron Sandack’s district office at 630-737-0504; or Jim Durkin’s District office at 630-325-2028 or Senator Christine Radogno’s Office at 630-243-0800.